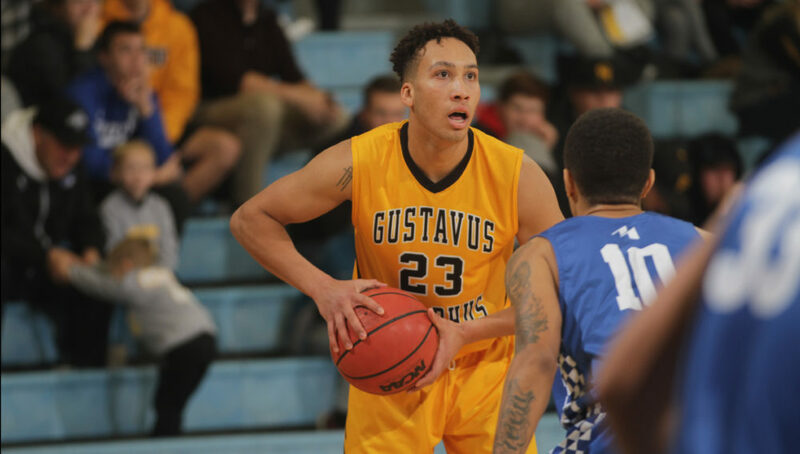 SAINT PETER, Minn. – The Gustavus men’s basketball team dropped their season opener to Mayville State on Saturday night by a score of 93-68. The Gusties jumped out to an early 21-13 lead on the Comets thanks to eight early points from Vannis Smith (Jr., Crystal Lake, Ill.). Mayville State battled back though and evened the score at 21 apiece before Spencer Tollefson (Sr., New Richland, Minn.) scored two of his 11 points on the night to give the Gusties a 23-21 lead. The 23-21 lead was the last lead the Gusties saw of the night as the Comets went on a 9-0 run that put them up 30-23. Gustavus and Mayville State battled back and forth for the rest of the first half and the Comets went into halftime with a 48-43 lead. The second half was all Comets as they outscored the Gusties by a 45-25 margin to help them take home the 25 point victory. Field goal percentage proved to be a big factor as the Gusties shot 23-54 (42%) from the field while the Comets shot 37-62 (59%). In the contest, the Gusties were led offensively by Smith who tallied 13 points on 5-9 shooting. Nolan Malo (Fy., Owatonna, Minn.) played solid in his collegiate debut notching nine points to go along with a team-leading six rebounds. The Gusties will next be in action on Saturday when they host Northwestern for a 7 p.m. contest.